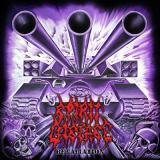 Hailing from Finland, Spirit Disease has been spreading their brand of thrashing death metal and grind-spurts since 2002. Retaliation is the band’s second LP and is quite aptly described by the group’s own description of their music: “steamrolls like a bull on steroids and grooves like a headless rhino.” One can find the kind of 90s brutality that At The Gates perfected while also seeing touches of Bolt Thrower and a tiny bit of fellow Finns Rotten Sound in there as well. The guys remember to add the more-than-proficient solo and infusions of melody here and there while overall keeping it nicely brutal. The band’s lengthy history shows commendably in their technical chops from the mincing blast beats to the pummelling stringassaults. Singer Tuberculosis brings a slightly muddy yet hefty growl/screech aching to the might of David Vincent while guitarist Koskinen and bassist Sallanen seemingly provide vocals for those always-tasty-when-done-right gang shouts. With song titles like Keep The Hate, Nothing But Death and Suffocate In Depravity, you can easily deduct the record’s thematic lines. The intensity and quality is retained in grand fashion on speedy tracks like Collateral Damage and Spawn Of Satan while Love Is Blood Red (my favourite thus far) introduces a brilliantly thrashing mode that combines some melodies and groovy riffage to great effects. On the lesser side we find a plodding track like Watch Them Die and You Should Be Killed, which mostly comes off as a pastiche of a Cannibal Corpse-scorcher that succumbed to rigor mortis way too soon. Fortunately versatility is provided near the end. One Bullet For You momentarily turns the course toward Discharge and other advocators of the D-beat. The 6-second burst Hoarse clearly feels like an homage to Napalm Death’s more progressive moments. The album closer Destroy Everything With Hate reaches out for slightly more epic grounds with massive, tempo-changing riffs, sweet double bass furries, a furious solo battle between the guitarists and a seriously infectious chorus that should slay on the live stage. This album was my first encounter with Spirit Disease and it was a very pleasant one. The production job is strong on every front and with the exception of a few lazy tunes, these guys seem to have a knack for catchy brutality. I expect ever improving and more versatile things from these guys in the near future so keep those orifices peeled.